Columbus is a great city for lesbian and gay travelers - if you need proof, make sure you visit during Pride - June 15-17! The whole city is full of things to see and do, but if you need to narrow it down, we picked five events during the Columbus Pride Festival to show you how diverse and creative the city&apos;s LGBTQ community is. The Parade: This exuberant celebration kicks off at 10:30 a.m. on Sat., June 16, at High St. and Goodale Blvd. The route follows High Street south to Broad Street, and then west to its end at Washington Boulevard. The route is about 1.2 miles in total, and it&apos;s not unusual for 500,000 spectators to line the sidewalks. Park. Pro-tip: Grab breakfast or a snack from the North Market and stake out a viewing spot early. Live Entertainment: With three stages, there&apos;s something to see almost any time during the festival. Local favorites like the Capital Pride band and the Columbus Gay Men&apos;s Chorus join national acts like emcee Sandra Valls and Liberty Deep Down. Bat n&apos; Rouge: Join the Columbus Lesbian and Gay Softball Association for the 31st Annual Bat N’ Rouge! This 32 year old event is a charity fundraiser that supports Stonewall Columbus, Kaleidoscope Youth Center, Equitas Health and CLGSA. This event is on Sunday, June 17, at Dodge Park in Franklinton. Paddle the Scioto with HERO USA: Pride will be lining the Scioto Mile with activities, but did you know you can actually get IN the river, too? HERO USA will offer kayak and stand-up-paddle boarding from 10 a.m.-7 p.m. on Saturday and Sunday. More info is here. Union Cafe/Axis Nightclub: Union and Axis are two of Columbus’ most popular neighborhood LGBTQ bars any time of year, but especially during Pride weekend. 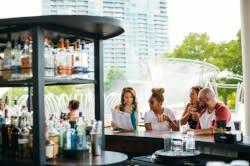 From brunch at Union in the mornings to a drag show at Axis in the evenings and a lot of entertainment in between, you&apos;ll be sure to have a good time at any time throughout the weekend. Make sure to stop by the Experience Columbus booth, a sponsor of the Pride Festival, for some great giveaways, visitor information and the opportunity to win a DSW gift card! Before you come, download our LGBTQ guide, pick one up at an Experience Columbus Visitor Center or at the Experience Columbus booth at Pride.